Quite. I’m not even a hundred percent sure I will be able to tell you what it means. But I think that something like What Is So Brittle That It Breaks If You Say It Out Loud? will do. This short novel – novella, really – by Bjørn Sortland is my Norwegian offering for my foreign reading challenge. I had read about it on the blog Tonårsboken, where they really, really loved it, and then when I was asking for suggestions it popped up again. Now, Norwegians are different. 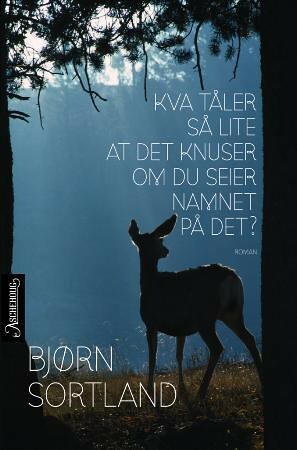 You look Bjørn up on the internet and you get not just his books and stuff, but his address and phone number as well. (Just don’t all call him today, OK?) So I asked how I could get hold of his book, and luckily he didn’t tell me to buy it, but sorted me out with a contact. What I didn’t know was that I’d let myself in for reading the ‘other’ kind of Norwegian, called nynorsk. But you get used to it after a bit. What is actually funny – well, I think so – is that this language which is supposed to be so very Norwegian that it doesn’t use the standard international words that you find in most western languages, now has modern imports like google and showoff and even utrendy (untrendy). And ‘whatever’. As I said, it’s very short. It’s almost a poem, with very little text on each page, and it reads beautifully. 19-year-old Markus meets a bald girl at a party and falls instantly in love. He’s not used to wooing girls, and Ingrid strikes him as older than him. She is. She is also dying. After a few false starts they get together. Sort of. Markus is scared of talking about her cancer, while desperately wanting Ingrid to say she loves him. Because this is so short and tender, there is little point in saying much more about the plot. Whether it’s typically Norwegian I can’t say. It feels Nordic, to me. The characters are more independent than their British or American counterparts. And perhaps more naïve and innocent. You’ll want to cry at the end. Luckily I turned back to page one at that point, and was able to laugh as Markus tries to avoid speaking to someone at the party. “I need to powder my nose’ he says, as he leaves. This entry was posted in Authors, Blogs, Books, Languages, Reading, Review and tagged Bjørn Sortland, Bookwitch Foreign Reading Challenge, Tonårsboken. Bookmark the permalink. And I suppose that sounds quite good. or even perhaps just: “Something So Fragile” ? Sounds like a lovely book, anyway – hope they translate it! I’m clearly no good at this at all. Too poetic and I’m useless. Norge ER DET IKKE !